On Sale Now! Free Shipping Included! 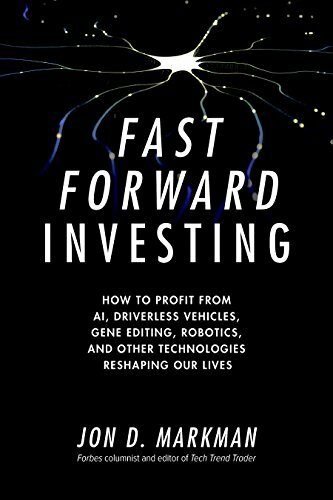 Save 3% on the Fast Forward Investing: How to Profit from AI, Driverless Vehicles, Gene Editing, Robotics, and Other Technologies Reshaping Our Lives by McGraw-Hill Education at HYIP Offer. Hurry! Limited time offer. Offer valid only while supplies last. Invest in the future! Everything you need to capitalize on the tech revolutionOur lives are on the verge of being reshaped by advanced technology. Our lives are on the verge of being reshaped by advanced technology. Fast Forward Investing provides the knowledge and insight you need to build and maintain your portfolio accordingly. Author Jon D. Markman is a veteran tech investor, money manager, and award-winning author of the popular daily newsletter Tech Trend Trader. There’s no one more qualified to help you design a portfolio that extracts huge profits from the shares of public technology companies and helps you augment your gains with conviction during stretches of high volatility. In Fast Forward Investing, Markman describes what to expect, when to expect it, and how to profit in impending technological and economic revolution. Revealing the most important companies in the industry that are right now building platforms and competitive advantages that will disrupt and transform their markets, he shows which trends are important and provides detailed guidance for staying ahead of the curve. Radical advances in data collection and analytics, artificial intelligence and raw computing power are changing human history. And it’s happening with sharp advances at incredible speed. Make sure you’re at the tip of the spear with Fast Forward Investing.